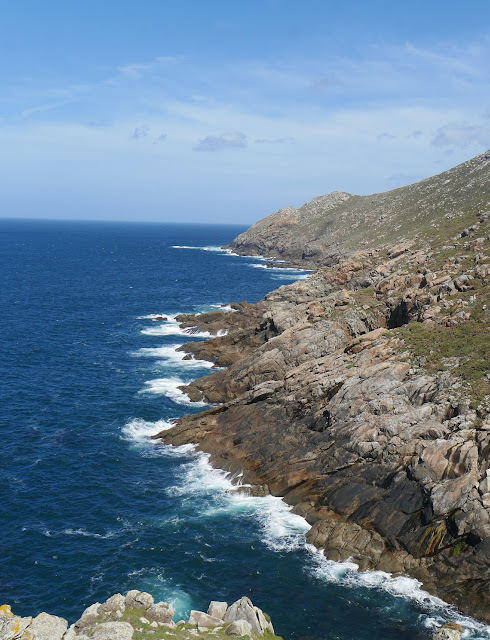 Today we walked from Muxia to Nemiña, a tough stretch of walking but excellent. 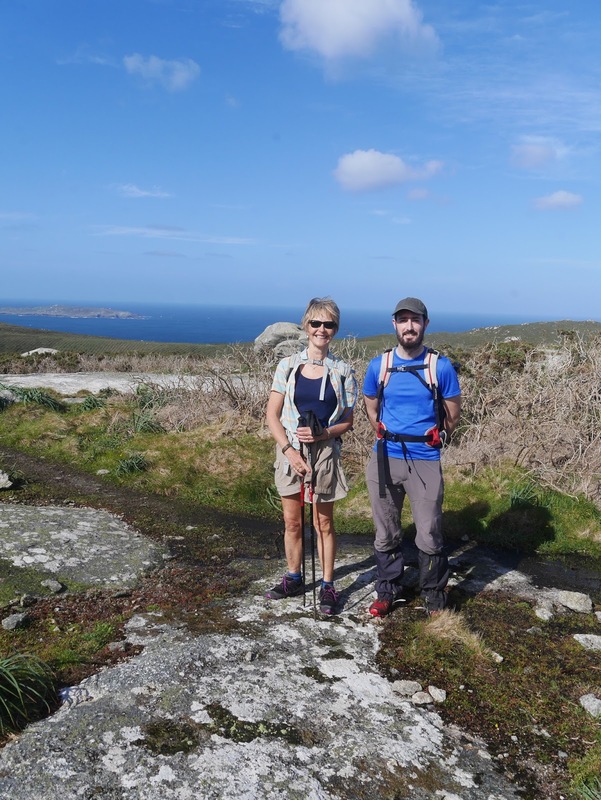 The weather was perfect, the scenery was fantastic and we even managed to adopt a Galician guide to show us the way. What more could we ask for? Keen eyed readers will spot that we have missed out a chunk of the Camiño. The original plan involved walking from Camarinas to Muxia yesterday. This was just too far, we were knackered from the previous day and the weather forecast was poor. We decided to have a rest day, got a taxi for most of the way (Praia do Logo) and after a 10km walk ate a late lunch and had a rest. The weather turned out to be OK, Christine even had a swim in the sea (very short), but taking a break was a good move as the last two days are tough. 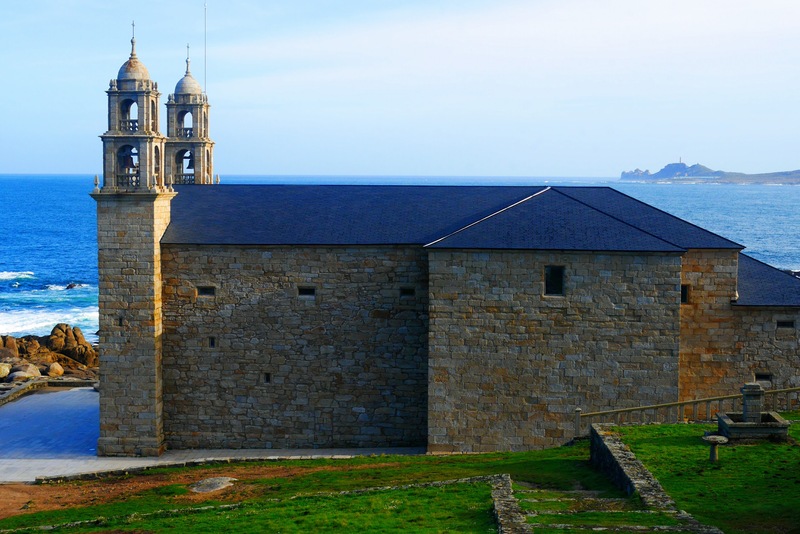 After a walk down to the end of peninsula in Muxia, a visit to the stunningly located church, which sits on a platform immediately above breaking waves, we marched along a road to the beach at Lourido. For a time we had been sharing our route with the Camino de Santiago and as we left it, went down to the beach, a local suggested we might be going the wrong way. Compared to the Camiño Dos Faros the Camino de Santiago takes the easy way to Fisterra so perhaps he thought we weren't up to rigours of the coastal path. Our confidence was challenged further a few moments later when we met a young Galician, his name turned out to be Alex, who pointed out that we were on a tough walk and that this was the hardest part of the Camiño Dos Faros. Everyone seemed to be suggesting we went the easy away to Fisterra. Well it wasn't too bad but we were lucky with the weather. There was more climbing than on the other sections but the three climbs and steep descents were all completed in the first half of the day, when we still had some energy left in our aged tanks. 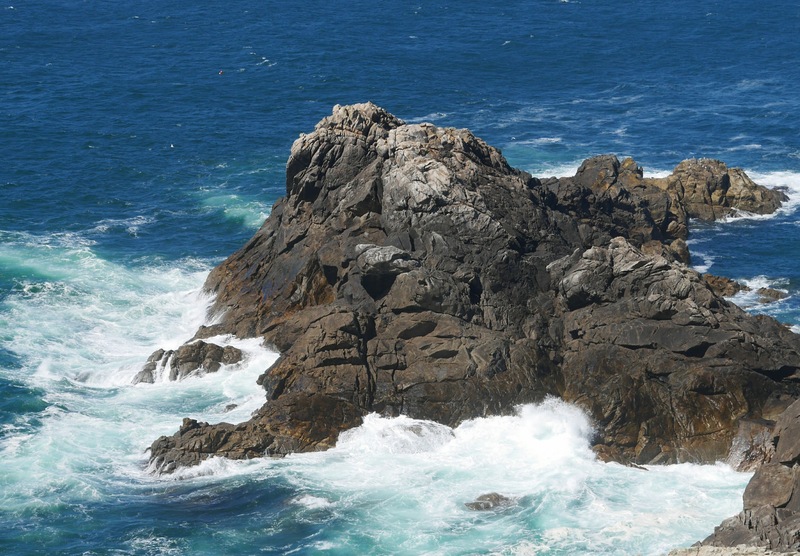 Christine also chose to lie down and listen to the waves crashing on the rocks rather than walk around the peninsula at Cabo Touriñán giving her an hour to recover for the last stretch. Alex I think decided to stay with us to make sure that we made it safely to the other end. He was great company and it was interesting to talk to him about the Camiño Dos Faros, Galicia and Spain. He reminded us how tough things still are for young people in this country and that the 'crisis' just doesn't seem to end. Tonight we are staying at Casa Fonte Queirosa, a great place in the middle of nowhere. Great food, lovely hostess, and very comfortable rooms with huge views across cow filled meadows down to the sea. Best of all the hostess provided dinner at the very English hour of 8 o'clock. The perfect end to a perfect day. In Muxia we stayed at the Hotel a de Lola - very modern, comfortable but a little soulless. In Nemiña (about a kilometre off the route) we stayed at the stunning Casa Fontequeroso - very kind hostess (she picked us up) and wonderful food, thoroughly recommended. 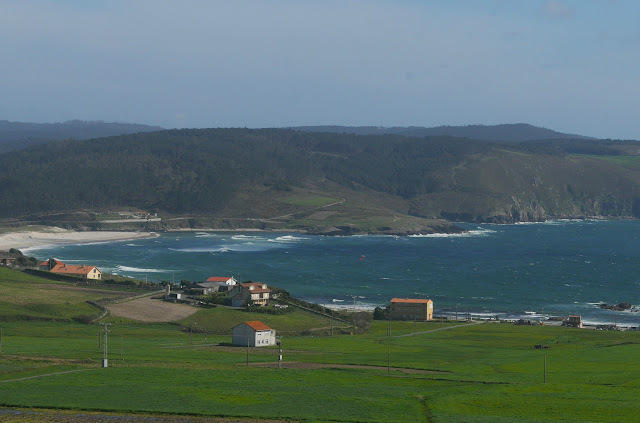 This part of the Camiño is nice but I found the one between Nemiña and Fisterra even better :). I hope you have a great day. Thanks for your comment. It's raining cats and dogs, it's my wife birthday and she has 'gone on strike' - no coast path today I'm afraid. Taxi to Fisterra! Hi Alex, great to hear from you. Thanks for your company. 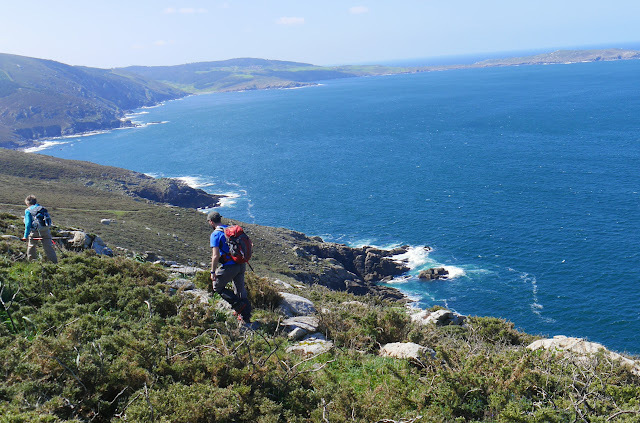 I learnt a lot about the walk, Galicia and Spain although there is just so much to learn. Hope all goes well with your plans. I was on the Camiño dos Faros for too short a time but I'm sure lots more English people would love to walk it once they get to know about it.